Arthouse Accommodation has everything to offer. It is nestled amoung trees in a quiet, peaceful and private location yet it is only 2kms to Jervis Bay and minutes away from Hyams Beach, Booderee National Park and St.Georges Basin. Arthouse is an architect-designed home with high quality inclusions. Sited on 2.5 acres the house was designed to achieve integration with the natural landscape. It is oriented to the north and has a choice of patios to accomodate wind and weather. It is cool in Summer and warm in Winter. Containing 2 bedrooms - one has a Queen bed and the other has two single beds which can be zipped and locked together to form a King bed if required. Every room has a view which makes you feel a part of the surrounding bushland. All bed linen and bath towels are provided. Arthouse Accomodation is available for holiday rental or short-term stay. Couples, families of four and corporate visitors are most WELCOME. 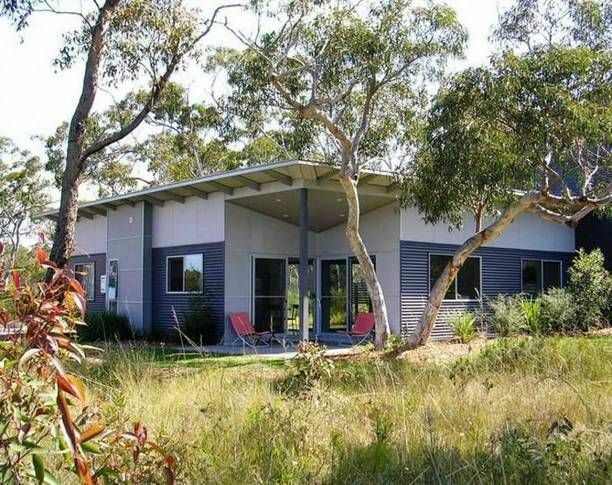 Arthouse Accommodation is located in a bushland setting. It is walking distance from the Bay to Basin Leisure Centre, 2kms to Vincentia Beaches and shopping centre and adjacent to the Bay to Basin cylceway. The location of Arthouse provides a holiday lifestyle to suit a wide variety of inclinations - native plant enthusiasts, bushwalking, mountain biking, swimming, snorkeling, diving, fishing, tennis, golf, cycling, cruises, art galleries, musuems, cafes, restaurants and service clubs or simply a great chance to relax. Feel free to walk around the property and explore the surrounding bushland. You will discover a rich diversity of plant species which display a feast of colour, especially in the Summer months. HIGH SEASON- $1785/wk week includes December, January and Easter. MID SEASON- $990 per week includes Feb, March, April ( except Easter), Public Hol long weekends,School holidays Sept/Oct,Nov. LOW SEASON- $870/wk includes May, June, July Aug, Sept, and Oct (ex school holiday). We require 50% deposit within 1 week of booking and the balance paid a week prior to arrival. The property had everything we needed, gorgeous outlook, very quiet and close to shops and beaches. We had a great time and would love to come back for a holiday, great area. I stayed here on the 6th- 7th May 2017 and it was incredible! Myself and 3 friends stayed at the property so that we could check out Hyams Beach- we could not believe how close the property was to this beach- less than a 10 minute drive! The house is located in gorgeous bushland with views from every window. The house itself was spacious and so well stocked. The house was immaculate- the bathroom is huge!! The beds were comfy, the house was lovely and cool when we arrived thanks to the air con, and lovely and warm when we settled in for the evening. I have recommend this place to all of my work colleagues and friends. Thanks to Kay for letting us stay and we hope to be back soon! It was great to get out of Sydney for an extended weekend, although the weather didn't play ball the accommodation was great. Great location to all services and local attractions. We plan to come back. We had a nice short stay. Close to all you need. We relaxed the moment we arrived. Looking out onto the bush was wonderful and a visit from a kangaroo one morning was a bonus. The house was clean and extremely comfortable. We had been unsure about staying here as it meant having to drive to the beach and restaurants. This was never a problem as the distances are not great. We enjoyed exploring different beaches and nearby National Parks. Being in the bush so near to the coast is perfect. The property is not that far off the road so some car noise could be heard during the day. The noise did not prevent us from enjoying the sounds of the birds in the trees that surround the house and it was very quiet at night. We really enjoyed our stay and would definitely stay again.